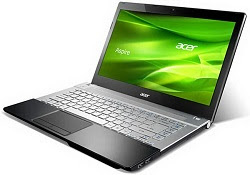 The Acer Aspire V3-571 is one of the best laptops that can be obtained with very limited budget. In the past, we used to assume that buying anything for less than £500 is to put up with a lackluster screen, little performance, and dire input devices. However, the Acer Aspire V3-571 laptop has clearly shown that price doesn’t always equate with limited aspirations. In terms of the design, the V3-571 is not a total success, and the color combination of black and grey is not that pleasing. The casing is sleek and slender, which makes it pretty easy to carry around. The weight of this device is 2.6kg. The two-button trackpad has been perfectly combined with the casing, which works effectively. While many laptops suffer from inconsistent and rough trackpads, it is not the case with Acer’s trackpads. It also provides enough room to navigate. The Acer’s keyboard has been designed especially for the laptops. It is a joy to type on the Scrabble-tile keyboard. Though some of the keys are small and hard to hit properly, the number and letter keys are proportioned suitably. You can have a high level of accuracy with this keyboard. The screen has the top resolution of 1366 x 768. It has an adequate color palette. Working with photos in Acer is quite interesting as the details levels are amazing. It is an easy laptop to work with notable clarity. The viewing angles are also superb. The Acer Aspire V3 comes with an i5 processor – an Intel Core i5-2450M of 2.5GHz. This processor is known for providing strong performance. The 6GB of DDR3 RAM is sufficient to perform any activities without any problem. This is remarkably fast for a £500 model. The storage capacity of this laptop is 500GB which is sufficient for many users. The Acer may not be the suitable choice for gamers. The Intel HD 3000 graphics controller is usable but underwhelming. So, this device is not so good for playing games. However, the enhanced model of V3-571 comes with discrete graphics and might be the proper device for the game lovers. The Dolby Sound System throws high quality audio. Connectors and ports are straightforward. One of the ports among the three is USB 3.0. You also get HDMI and VGA external output, the memory-card drive covers SD cards and xD-Picture as well as the MemoryStick. The wired network users are taken care by a gigabit port. The standard Matshita UJ8B0AW is the built-in DVD. It can burn up to the speed of 8x. On top of the screen there is an Acer Crystal Eye HD webcam. The Aspire comes with the 64-bit version of Windows 7 Home Premium. Useful Acer utilities and Microsoft Office Starter are some of the software offered in this device. The battery of the Acer Aspire V3-571 lasts for approximately 5 hours and 18 minutes, which is just sufficient. Seeing all the features, we can say that it is a perfect laptop. The price is also pretty reasonable. So, we can say that it is one of the best laptops to purchase.